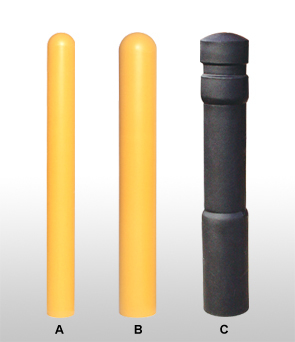 Simply slide these bollard covers, also referred to as a 'bollard sleeves', over existing posts—no tools or hardware required. Make those unsightly bollards look brand new. One-piece lightweight design makes installation quick and easy. Bright safety yellow color adds cosmetic appeal and helps identify entryways for trucks. All polyethylene construction. No maintenance required. Available in two wall thicknesses. Other sizes available upon request. UV inhibitor in resin resists degrading effects of sunlight. Measure exact post circumference (distance around post) with flat tape. Find the most suitable post diameter to order below.